So, at this point, you’ll have had your full consultation and skin analysis, (you will find all the details and booking info here), and you’ll also already know exactly what your skin needs in order to glow and stay super healthy. As a result of what you’ve learned, you’ve decided to take the plunge and give Botox a try. Eeek! I know, it’s both scary and exciting, right? What to expect during and after your Botox treatment. When it will start to take effect. The risks and possible side-effects. The aftercare you need to be aware of. Everything you need to know will be discussed again as you complete your consent form, to ensure you have a complete understanding of what’s about to happen and feel reassured. I will answer all questions you may still have at this point. Then, once you sign the consent form, I’ll take a few ‘before’ pictures in which I’ll get you to pull some funny faces while I assess your face’s muscle movements and unique anatomy. I’ll then make sure you’re comfortable on the treatment couch while gently cleansing the areas that we’re going to treat. Once your skin is prepared and make-up free, I’ll administer a few quick, tiny injections into the facial muscles which we want to treat. 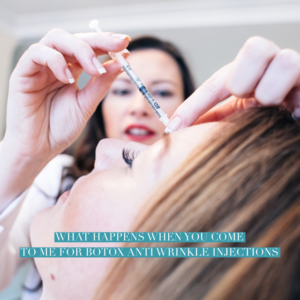 You can read about whether or not botox hurts here. Afterwards, I sometimes apply a cold compress and some calming lotion, but then, you’re done! Finally, after payment, we’ll book in your review appointment for two weeks later. This is a great opportunity for us to see how your Botox has progressed and look at your ‘before’ pictures. At your review appointment, I might add a little more Botox if we both agree that it’s needed. I’d always rather give you more at your review appointment as opposed to giving you too much in the first instance. After all, we want natural looking results, right? However, if you’re completely happy with the results after two weeks, you don’t have to come back for a review, but it’s reassuring to know you can if you’d like to. Especially if this is the first time having a Botox treatment or the first time I am treating you. Before you leave, I always make sure you’re clear on what you can and can’t do, as well as for how long, so it’s fresh in your mind. I also send you all your aftercare information via email too, along with my contact details should you need me or have any questions. So there you have it: A Botox treatment appointment with me, The Skin Nurse. If you’d like to find out if you’re suitable for Botox injections, you can book a consultation here and we will discuss your options.